I am wanting to attend both Juana Good Time Regatta Sept. 7th ,8th and 9th. 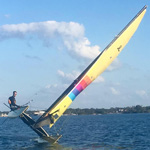 And also, I want to sail the 50/50 Round the Island, Fort Walton Yacht Club....Sept. 21st and 22nd....Now my question is what to do in between event without leaving the panhandle? if you don't mind the drive .... cedar key is pretty great. small, old school fl town (rapidly growing into tourist-ville, like everywhere in fl)... but great place to visit. sailing at high tide is fun and easy access (a whole road is a free ramp) right next to cool hotel ( farawayinn.com). low tides is "not foil friendly"
I have both those on the books for this year. Juana’s had like 100 beach cats 2 years ago when I went and was the most fun even for sure. The round the island was more of a put your game face on kinda weekend so fun wasn’t really the goal during the event. The fun is printed on the results sheet Ed’s for that if you did your job right. I’d probably come back between the events but I think you can camp out at ft Walton club.